Our authors were asked to contribute to Fluor’s Material Market Bulletin on cloud computing, procurement, and supply chain management. 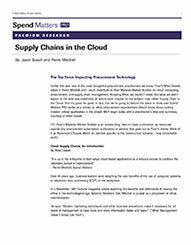 They didn’t expect the end result to be an entire book chapter on the subject, now called Supply Chain in the Cloud. It’s so rich in content and expertise that we decided to turn it into a research download as a primer on what procurement organizations should know about putting mission-critical procurement applications into the cloud. This Spend Matters PRO content has been made temporarily available for download by GEP. To get your free copy of Supply Chains in the Cloud, please complete the short form below. Members: Skip the form and log in to grab your free copy.